Go grab a sandwich, this will take a while, and this is the condensed version! I still haven't had any sleep, been up all night packing, hit the road around 4 AM. Get within 30 miles of ferry, and they call and cancelled the trip. D'Oh! Continue to Leland anyway, don't know why. Met guys from HammockForums, did an impromptu hike and hang. Total pack weight seems to be around 45 pounds. Left earlier this time, about 230 AM, got to Leland about 730, enough time for nice breakfast at Early Bird restaurant. Breakfast Chili Burrito, very good! 9:00 check in, boat leaves PROMPTLY at 10:00! Decided to try 16 nights, two weeks plus another weekend. Costs: Parking (17 days x $2) $34, Park Pass (annual) $20, camping (16 nights x $5) $80, boat (round trip) $32, TOTAL $166 not counting gas, equipment, supplies and food, etc. Boat was crowded, taking campers to both islands in one trip. 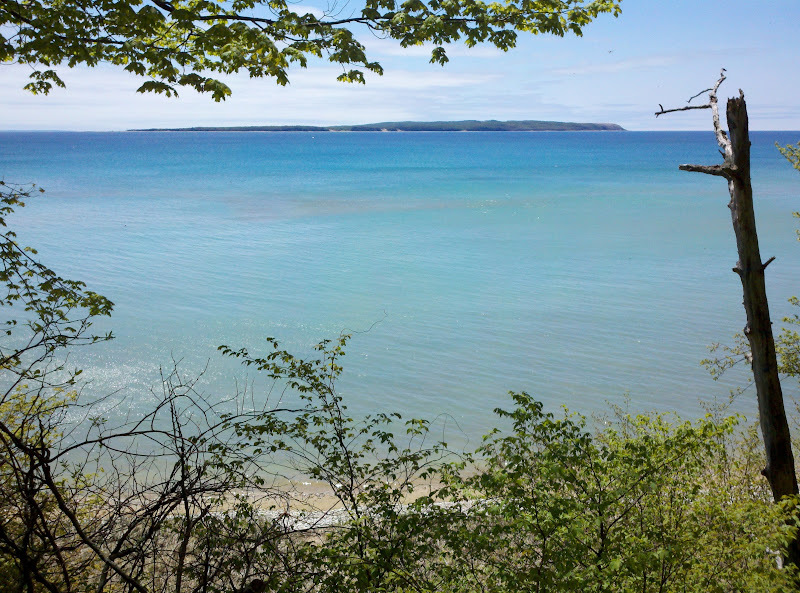 11:15 Boat arrives at North Manitou Island. Fog is so bad, Captain can't see dock. A gentle bump tells us we're here. 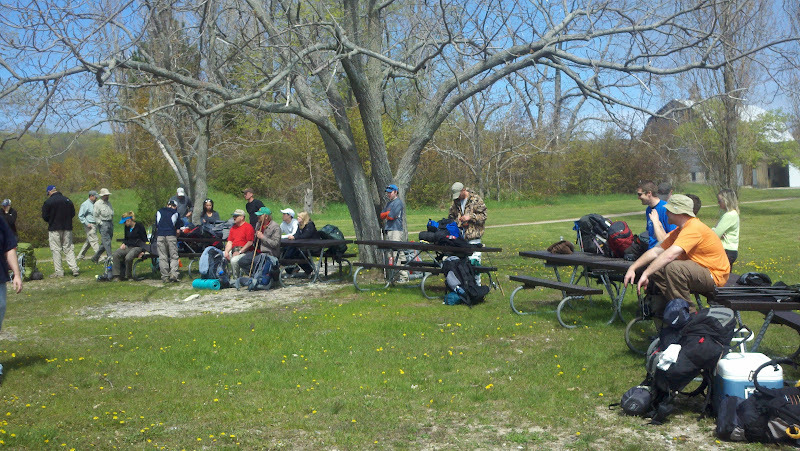 Ranger Phil Snow gives mandatory orientation and check in. Assistant ranger seems concerned about the length of my stay. Started hiking around noon. Beautiful sunny day, no bugs, fog lifted. 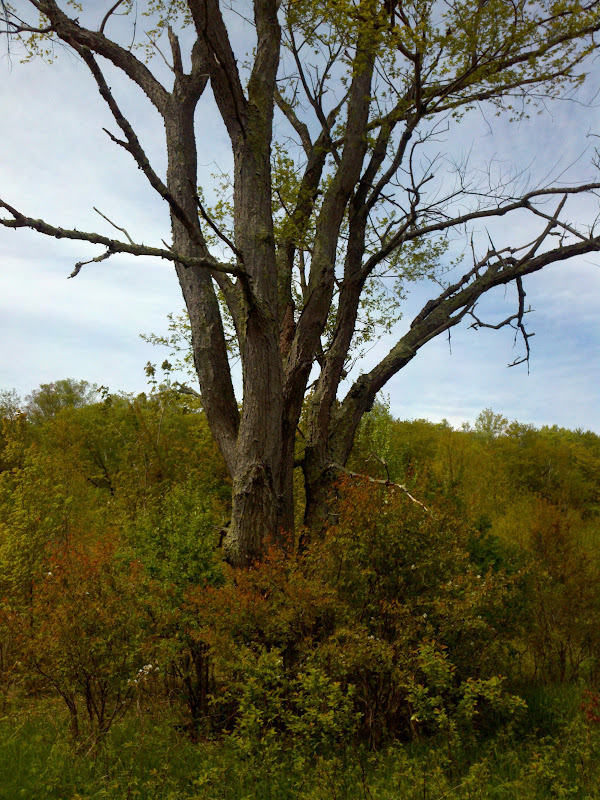 The trail is mostly well maintained already, but I find one tree over the main road that seems precariously perched. 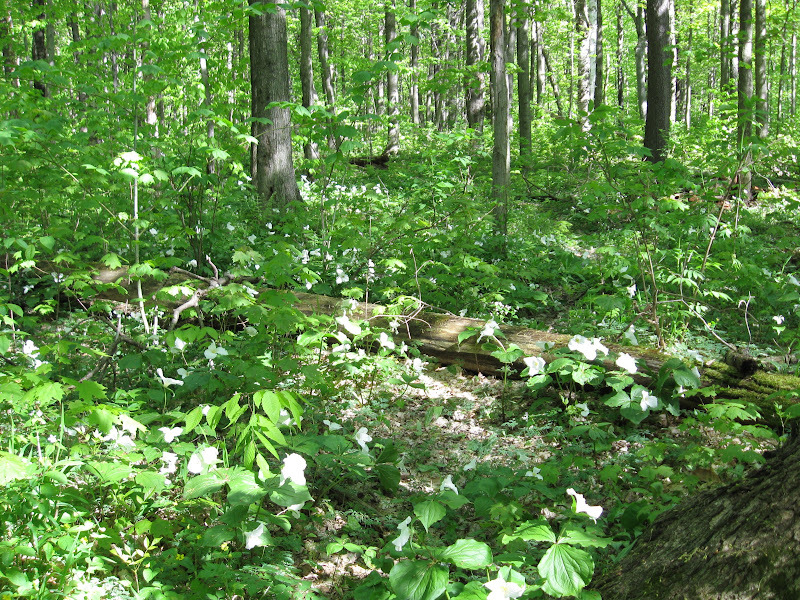 I planned to set camp by the Johnson Spring, but the road to it is difficult and I am getting tired, so I cut back to the main road and set camp in the field at Johnson Place. A deer is wandering in the field, munching on plants, not minding me at all. We walk past each other a few times as I search for the best trees. I finally set up camp in the back corner of the field, 658 feet from the water, according to my GPS. 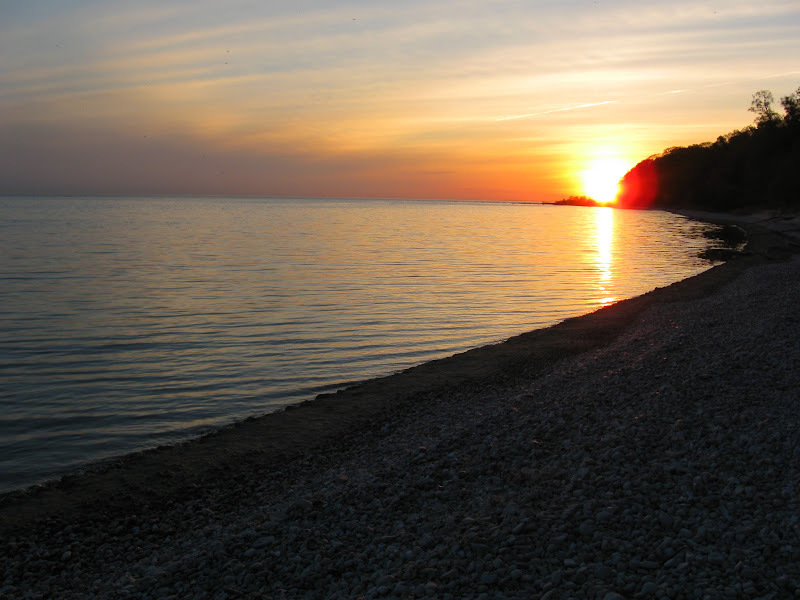 Grab a couple gallons of water from Lake Michigan. Lake Michigan is COLD in May! 2011-05-21, Saturday, Beautiful day, sunny, 75 degrees! 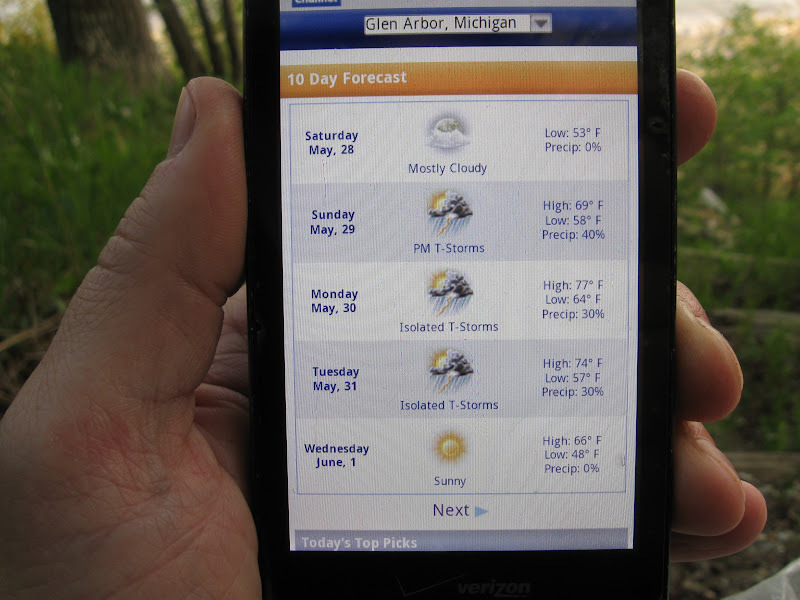 Cell phone service is not bad here at Johnson Place, best on the bluff overlooking Lake Michigan. I spend most of the morning making calls, catching up on the business I missed in the past few days getting here. Internet service is good, and I can get the weather forecast. Today's beautiful, but lots of rain is predicted for the next few days, and lows dropping into the 30s. 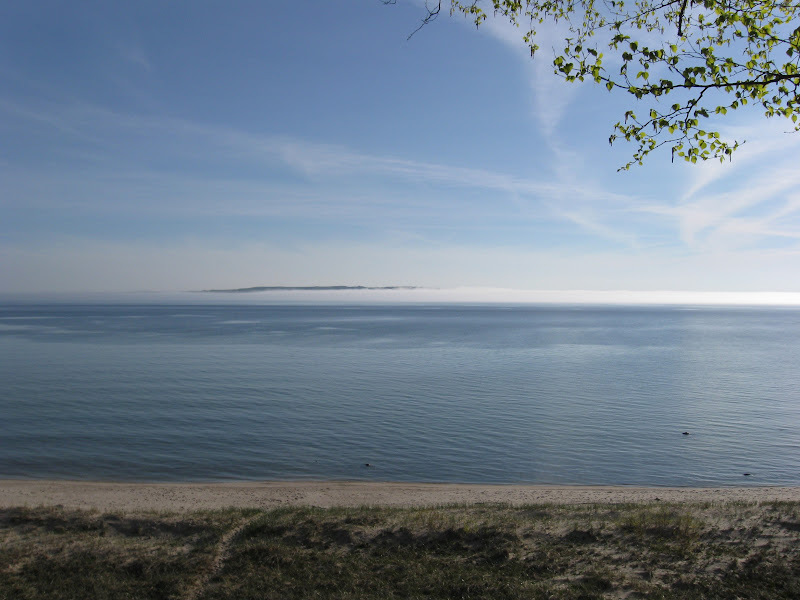 South Manitou Island, on the horizon, is mostly covered in fog. 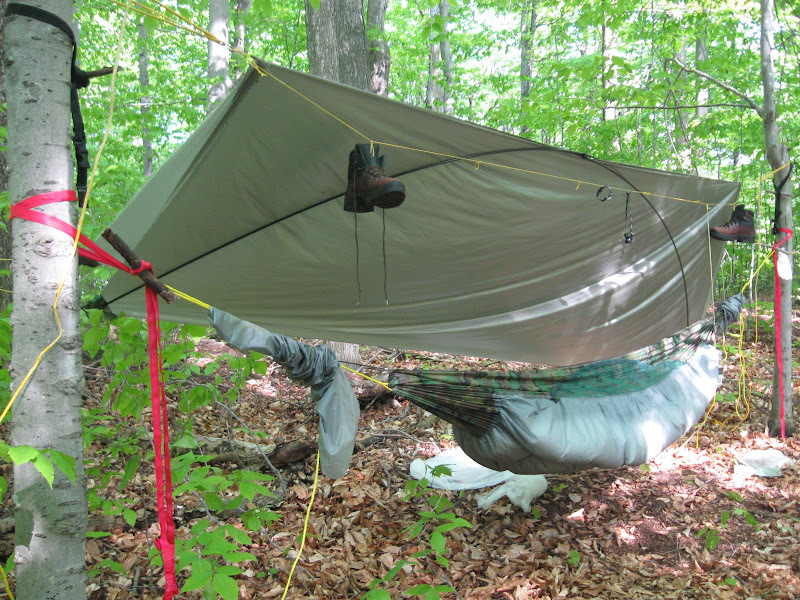 My hammock is a very simple design, a single sheet folded in half lengthwise, with a zipper on top. The ends are folded over and sewn shut, leaving a channel for the rope. It is completely enclosed and bug free. I have zippered windows covered with bug net screens. Underneath is sewn a sheet of sil-nylon and stuffed with down. My rainfly is new and not yet finished. Since I was planning for a two week solo trip to a wilderness preserve, I wanted to be prepared for all weather. 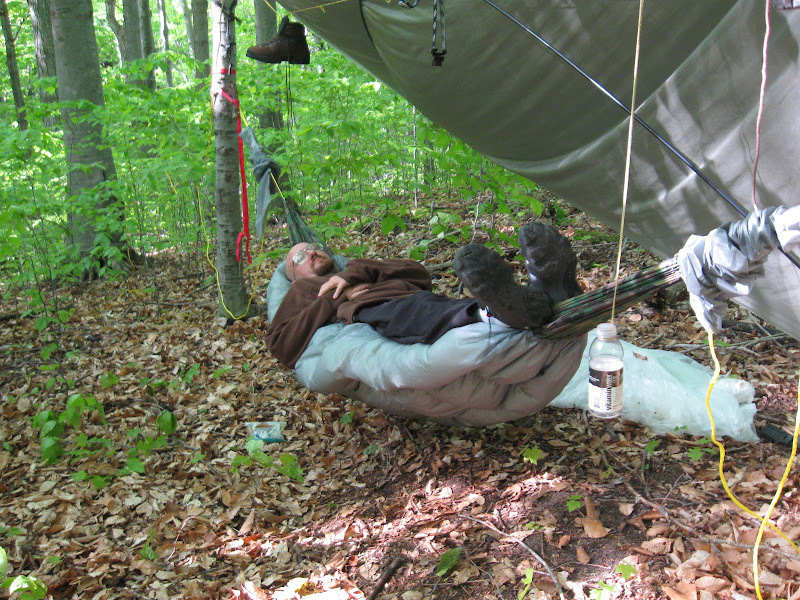 The fly is rectangular, about 8 x 11, and completely separate from the hammock. Thus it can be raised or lowered or even removed as needed. It's a spacious house without walls. The fly is supported by lightweight aluminum poles, so that it is free hanging. It does not need to be tied out on the corners, and will simply float with no guy lines to trip over. It can be staked out if desired, such as in high winds. I spend the afternoon relaxing and tinkering with my hammock suspension and taking pictures. Ranger Phil paid me a visit, wanted to let me know that he'll be leaving the island in the morning with the rest of the campers, and there won't be any other campers nor any rangers on the island until he returns Memorial Day weekend. I thought that was pretty neat. You can't get much more solitude than that! I draw a couple more gallons of freezing cold water from the lake, and enjoy the company of a hummingbird who was interested in my hammock with the yellow polypropylene ropes and the bright red tree straps. It starts raining as I cook dinner, just a sprinkling really, but my new 8'x11' rain fly gives me enough cover to cook under. Looks like it will be another beautiful day, sunny and warm. My clothesline (also for food and gear) has stretched out overnight. I'm looking forward to ordering some of that Amsteel those HammockForums guys were talking about. At night, the slugs like to come out. Always check your shoes! 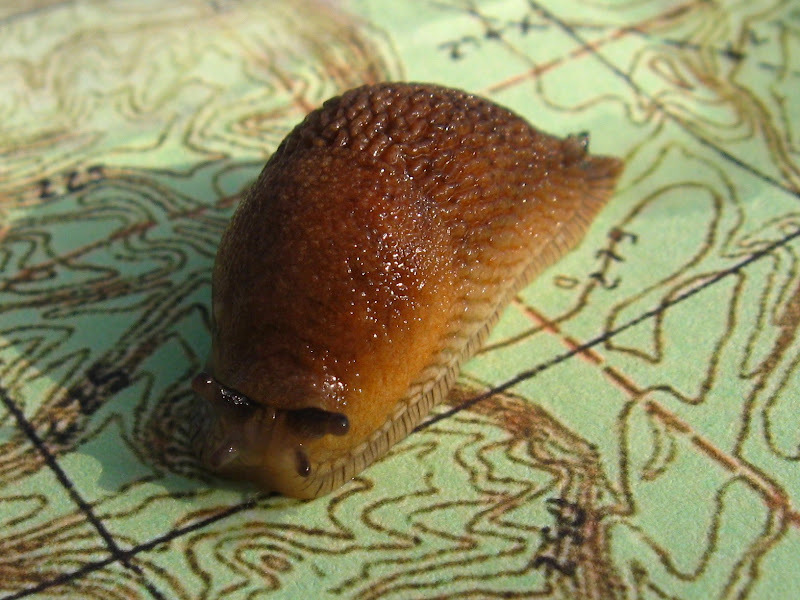 This little guy's making his way across my map of the island. All the bugs on the island seem bigger than back home. After making some adjustments to camp and setting out my solar chargers, I head for the spring. 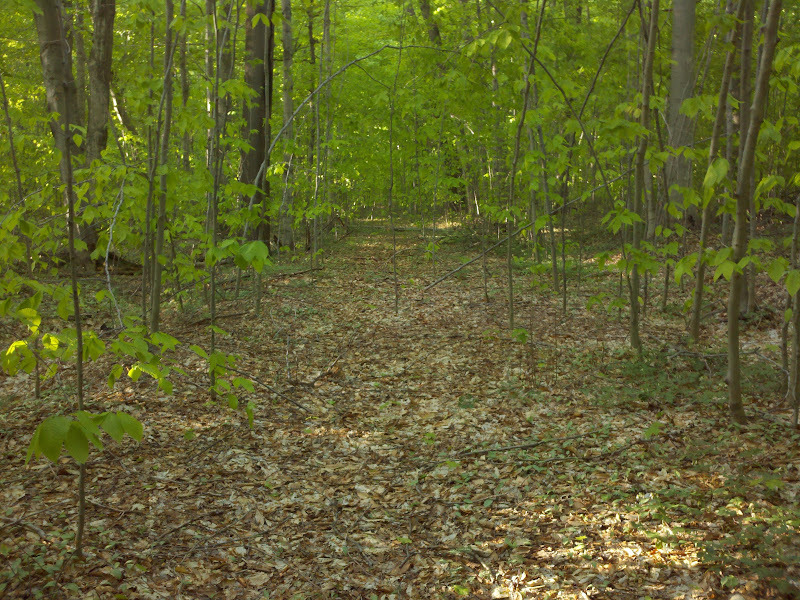 The road to the spring enters the woods not far from my hammock and heads east, but it's so overgrown that I lose it before long, and start bushwhacking. Finding the north-south road, I follow it south to where it intersects the road that goes around the Armstrong clearing. I've tried this in years past, but kept loosing it. This time I succeed, and now have it GPS track-logged. Then back north to the spring, and up the hill to where I first intended to set up camp two nights ago. But it turns out there was no good camping there, too much undergrowth everywhere, no sunshine, no easy access to water, and very poor cell phone reception. As I sit for a snack break, the thunder starts rolling in, so I double-time it back to camp, getting there with just enough time to batten the hatches before the storm hits. 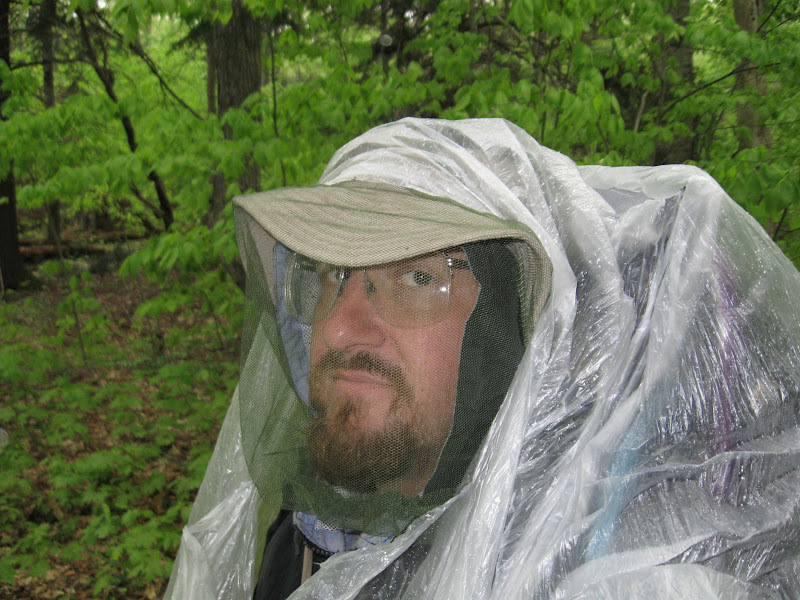 It is the worst storm I've ever camped in, and I find some problems in my rain fly design. It's a battle trying to stay dry. 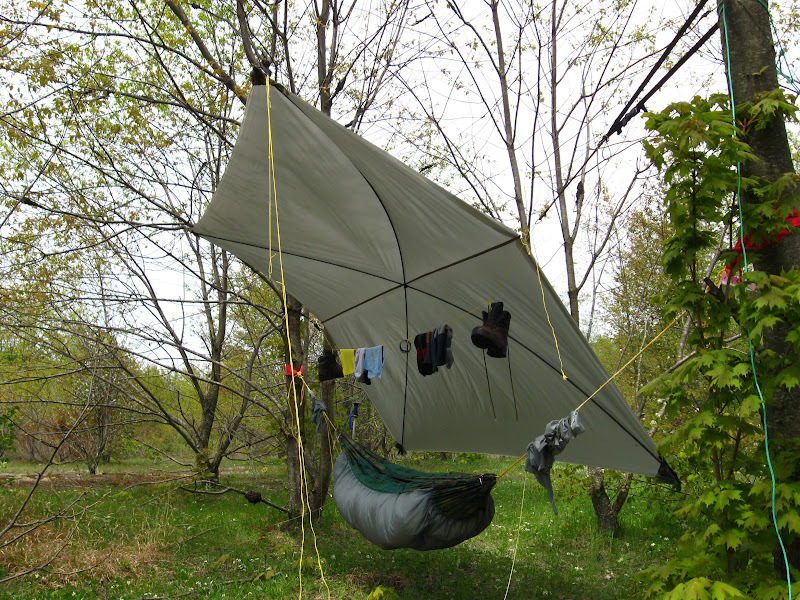 I'd drape my poncho over my hammock to shield it from the drips, which were coming almost every second now, but then the wind would blow the poncho off. 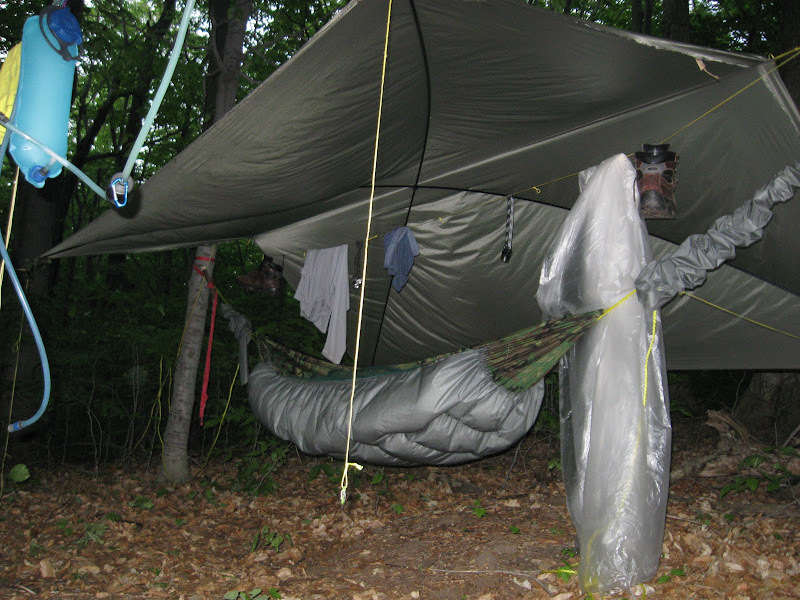 My sleeping bag got wet, and I didn't get much sleep for a while, in and out of the hammock, adjusting this and tightening that, trying different things to try to stay dry (or at least not get totally soaked). It was a long night. Somehow, I wake up dry and warm and in good spirits. The surf is high today, really churning up everything in the lake. Internet and cell service is intermittent now, but I am able to get a forecast, and it calls for thundershowers all afternoon and through the night, and highs tomorrow only in the 40s. Off to the spring I go for a couple more gallons of water, much cleaner than Lake Michigan now that everything's churned up from the waves. After an early dinner, I decide to take apart my hammock suspension and turn it into whoopie-slings. I was a little nervous taking apart the suspension to my only survival gear mid-trip, but everything worked out great. Next, it's back to the bluff to check messages again. 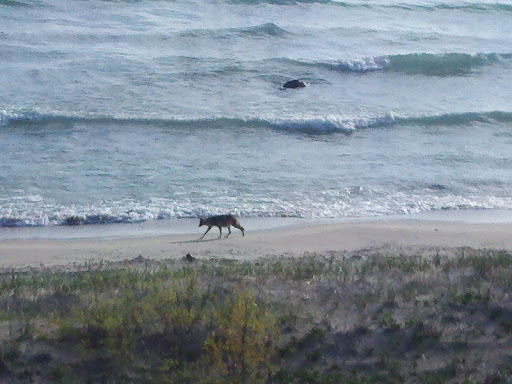 And then, the highlight of my trip: a coyote walking down the beach! Of course I'd heard them many times before over the years, but this was the first time I'd actually seen one on the island. How cool! This morning is a little chilly. I'm wearing all my clothes, plus my sleeping bag as a cloak. 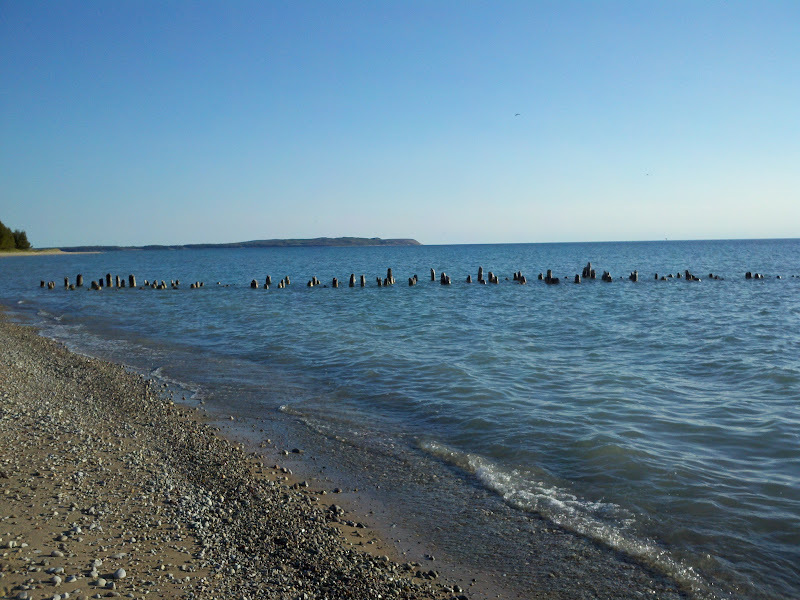 But it's a very clear day for visibility, giving a great view of South Manitou Island on the horizon. I checked my messages and made some more calls, and got the weather forecast. I'm under a FROST ADVISORY until tomorrow morning! But it's a great day for a hike, and I head to the north for the Potholes. 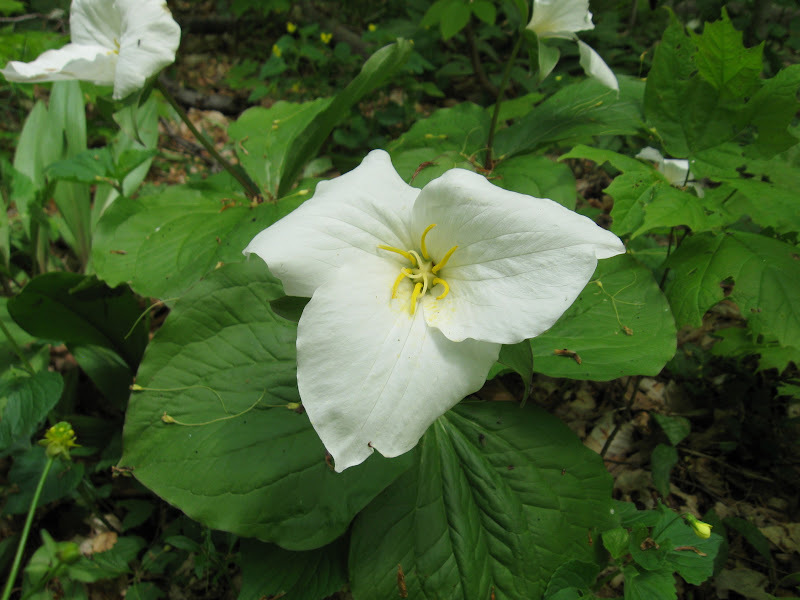 Along the way, there are many trilliums. They're all over the island. The trail to the potholes heads north from the mail trail. 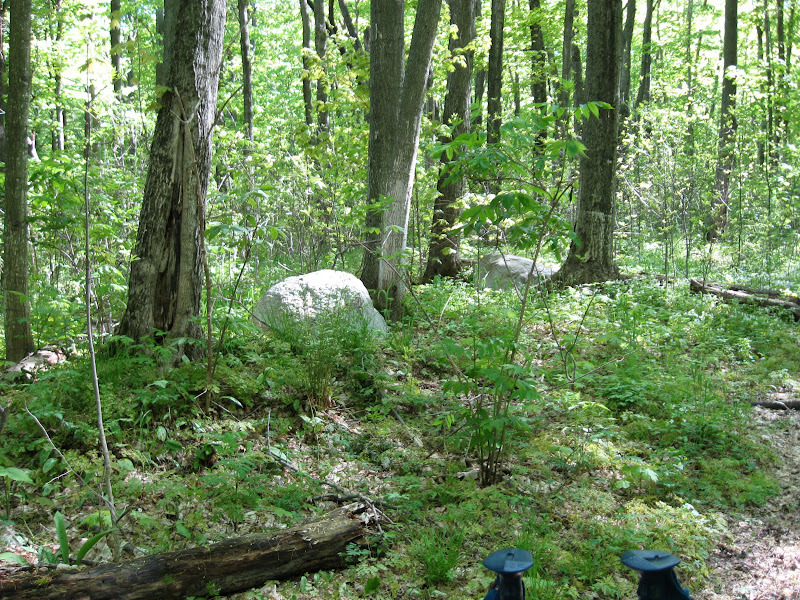 It may be a little overgrown at times, but can be easily located across the road from these two big rocks. It occurred to me that I've seen fewer chipmunks than normal, and more garter snakes, and a lot of the snakes seemed well fed. I think there's a connection. I made it to the potholes, and WOW, what a scenic hike! The pictures don't capture the three dimensional aspect of the landscape. I found a trail descending down into the easternmost of the potholes. It's a well used trail, steeper than most of the trails on this island, but not difficult. 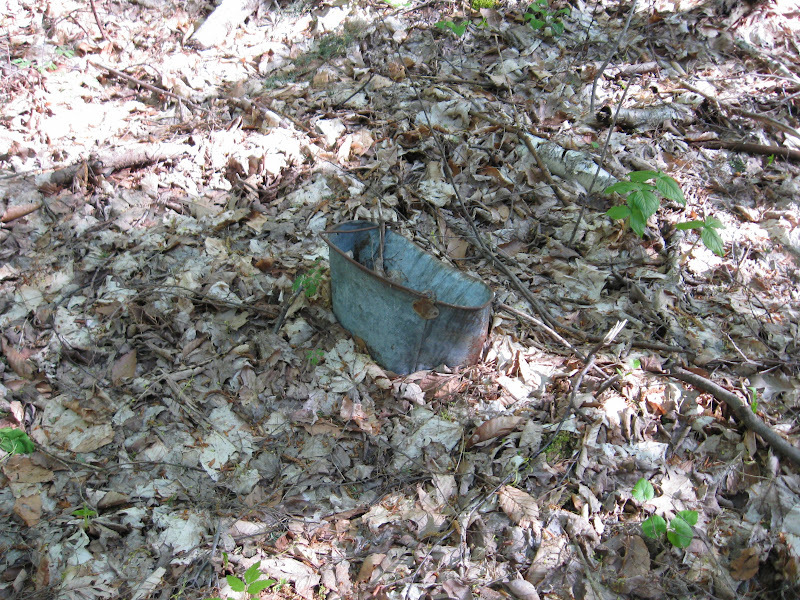 At the bottom, a bucket. It also continues to the west, but I don't have time. It will be getting dark before I make it back to camp as it is, so I'll have to return another day. I make it back to Crescent City, then cut down to the beach where you can still see the remains of the old west side dock, then hike the rest of the way in the sunset, rather than through the forest in the dark. 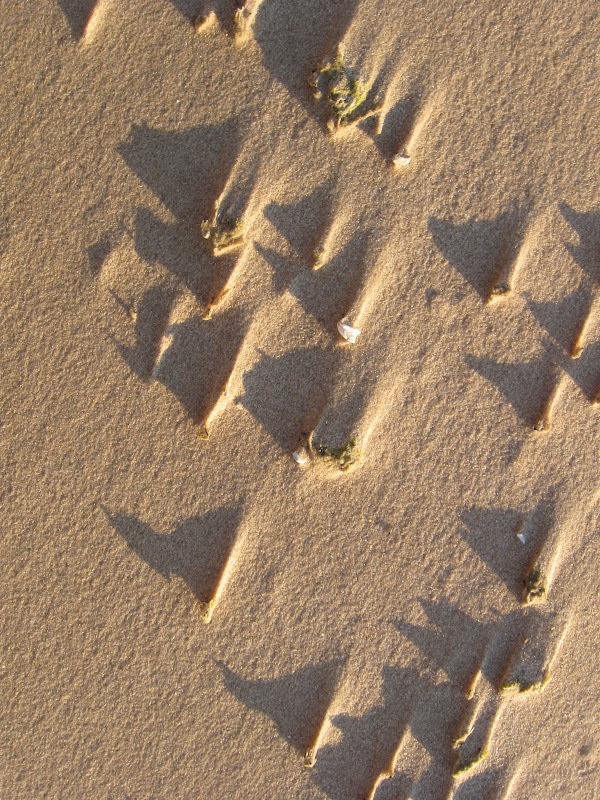 Little pieces of shells and algae had washed up onto the beach during the storm, and sand blew around them, and then blew away. What remained, in the setting sun, made for interesting shadows. I decided to sleep in today because of the frost, but it didn't feel any colder than yesterday morning. Today looks like another great day with blue skies. 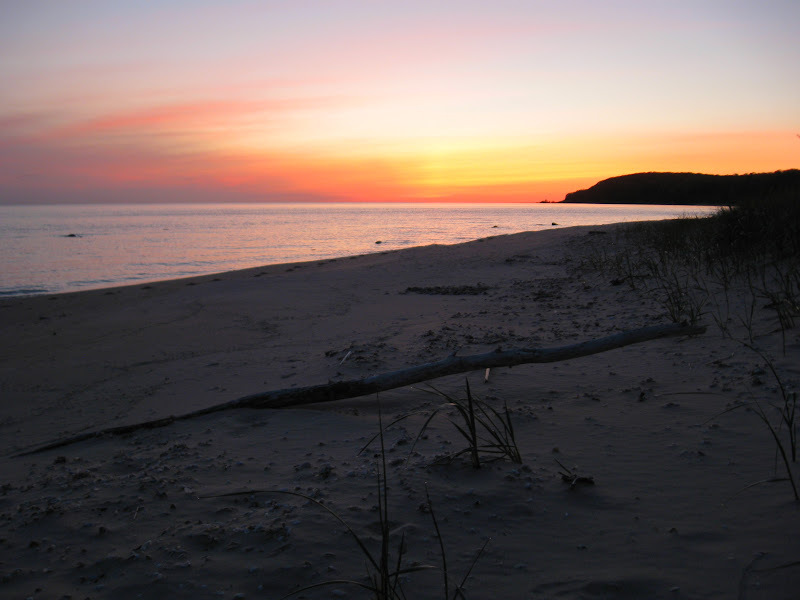 I'll have to move camp sooner or later, so I can hike other parts of the island, but I can't imagine a nicer campsite. I head south, and make it almost all the way down the Armstrong trail before it starts raining. I put on my new ginormous pack poncho, and what a failure! Maybe it's just too light, but it clings to everything like saran-wrap. I made it from a 1/2 mil plastic dropcloth. I got back to camp, made dinner, and turned in early. It's nice and warm and dry in my hammock, and cold and wet outside. So I was laying here, collecting my thoughts and jotting down some notes, when suddenly everything turned red. My camera was hanging under my rain fly, just above my head, so I grabbed it and shot this picture. What a cool sight! It only lasted a few minutes. Had it not been raining, I would have gone out to the bluff. I imagine it was an awesome sunset! Last night turned out to be a constant battle against the weather, the rain and the wind. Today started out cold, but is turning out nice and sunny. I make my way back down to Stormer Place, mark where both trails enter the field, and the location of the house. 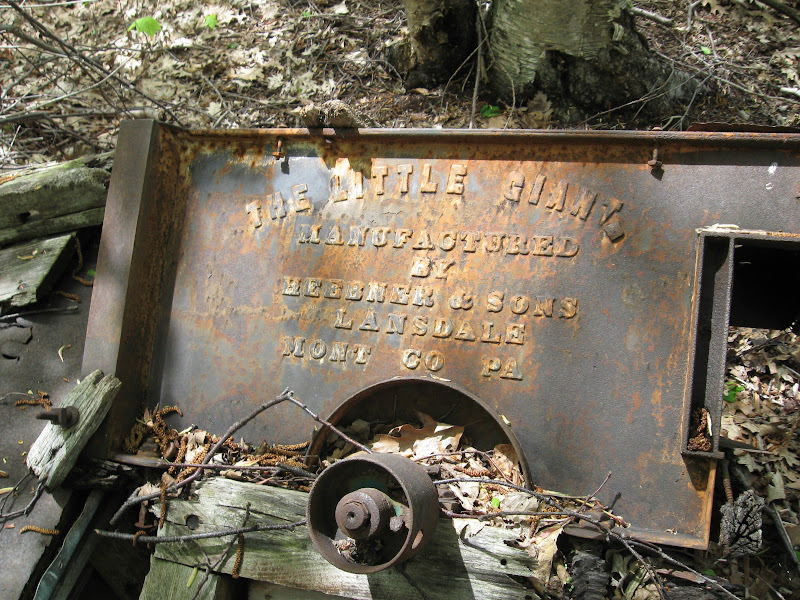 I also find The Little Giant. 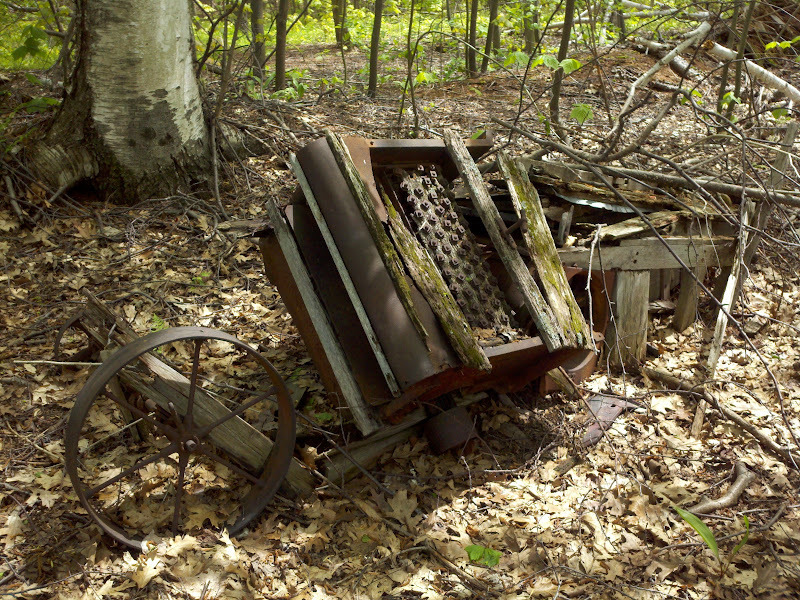 This was an old threshing machine, a forerunner to a modern combine. As I make my way back to camp, I meet a few kids looking for Old Baldy. They found me! lol. I show them where Old Baldy is on the map. They were on their senior trip. I think that would be such a fun trip! I've finally decide to move camp, to get out of the open field and into the protection of the forest where it won't be so windy. Tonight is supposed to be another cold night, and I'm tired of battling the wind. So I pack up, and head east down the long-forgotten road towards the spring. This time I am finally able to follow it all the way to the intersection, and now I have it saved on my GPS. 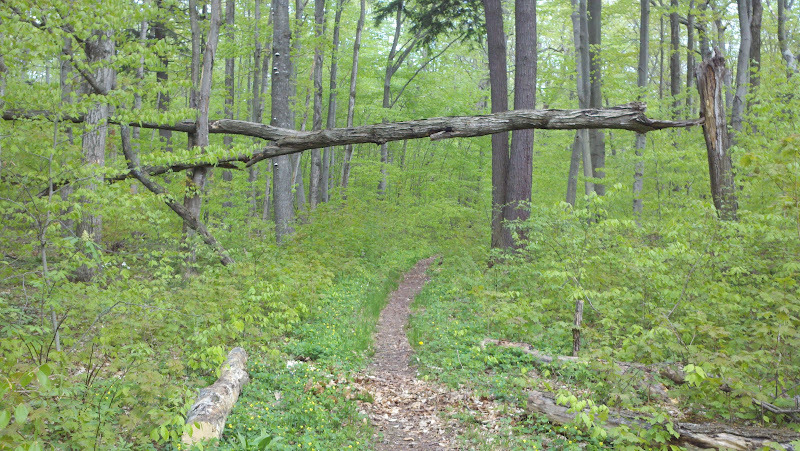 The road to the spring used to be quite wide and open, but now there are places where fallen trees block the way. But on the other side of the blockage, it opens right back up again. So now I'm at my new campsite, less than a half mile north of the spring. I emptied my pack, and am heading back again to the spring for water. It's getting late, so I hope I can make it back in time, before dark. I made good time getting to the spring, collected four gallons of water, and it was getting dark on my way back to camp. Now that I have water out of the way, I can set up camp, but I am doing it in the dark. Today looks and sounds like another beautiful day. It was nice to not have to worry about staking out the rain fly last night. Without a heavy wind, it can just hang on its own, spread out by the poles, no strings to duck under or trip over. 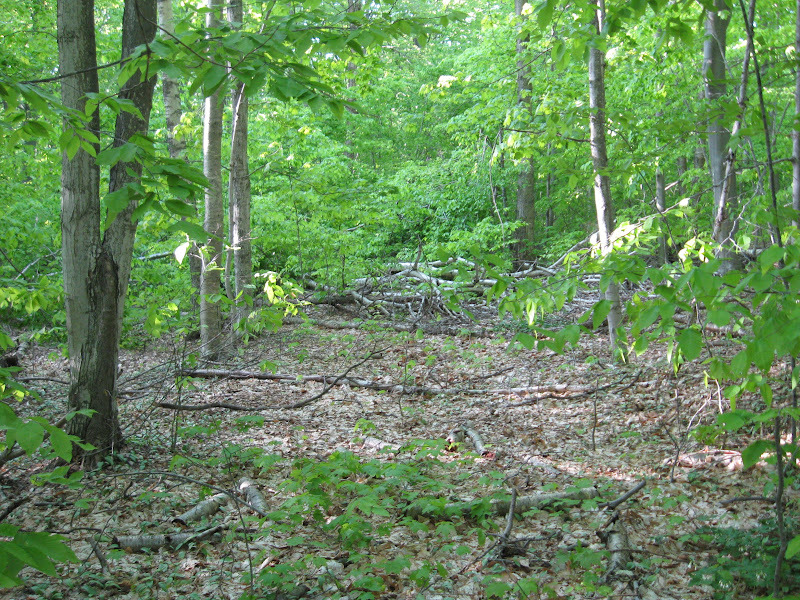 I can hear the wind roaring through the treetops above, but down here on the forest floor it's just a gentle breeze. Today turned out to be a relaxing stay-at-camp day, readjusting things, and studying my gear to see what's working and what needs improvements. I can see that my rain fly design needs some modifications, and the battery charging solar panels aren't working as well as I had hoped. My gravity feed base camp water filtration system is working great, though. I made a couple more whoopie slings for my rain fly, but I don't think that was a good idea. 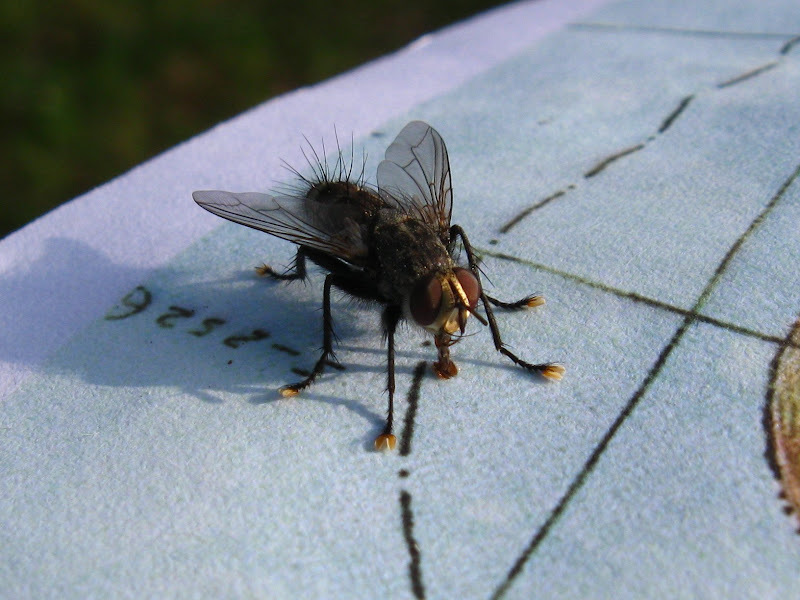 The fly you want taught, and whoopie slings are difficult to adjust when there is tension on them. 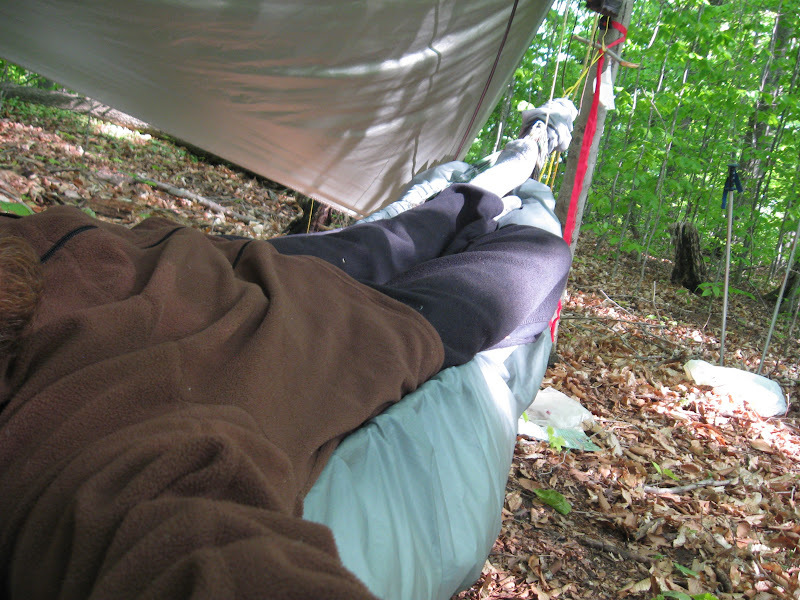 It rained all night and morning, and everything feels wet and cold outside, but dry and warm inside the hammock. Dealing with the rain was much easier without the wind. 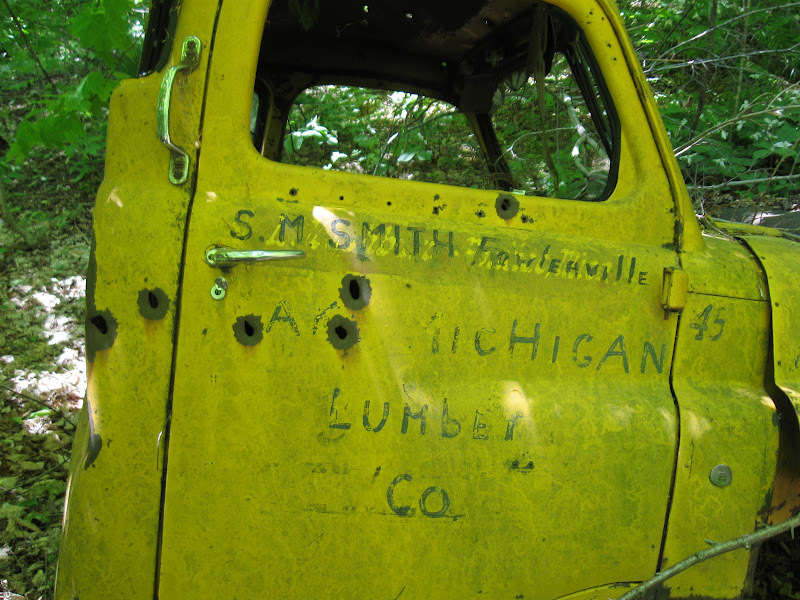 I'm glad I'm in the woods, and not an open field. The downside to this campsite is that there are no easy trails nearby, so to hike anywhere, it's going to be through a lot of wet undergrowth, and I don't have a decent poncho. 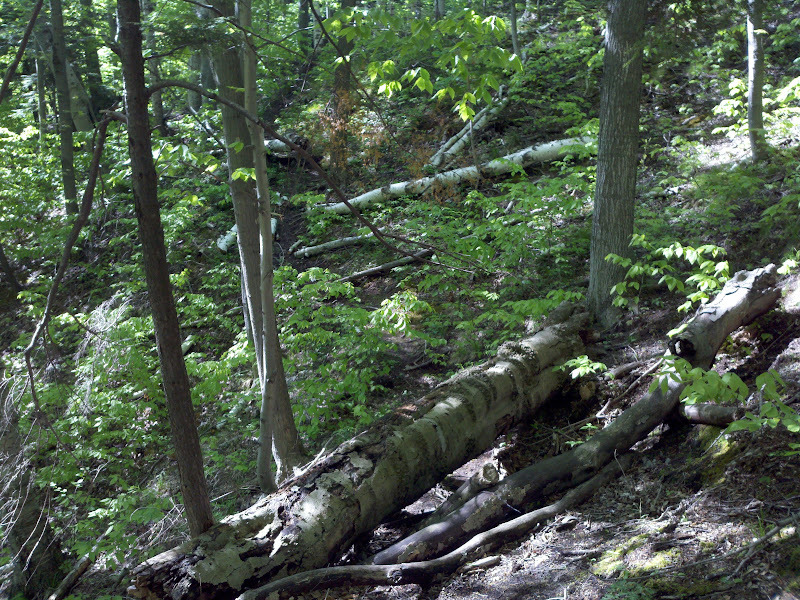 I hike north past Tamarack Lake, and find a downed tree. 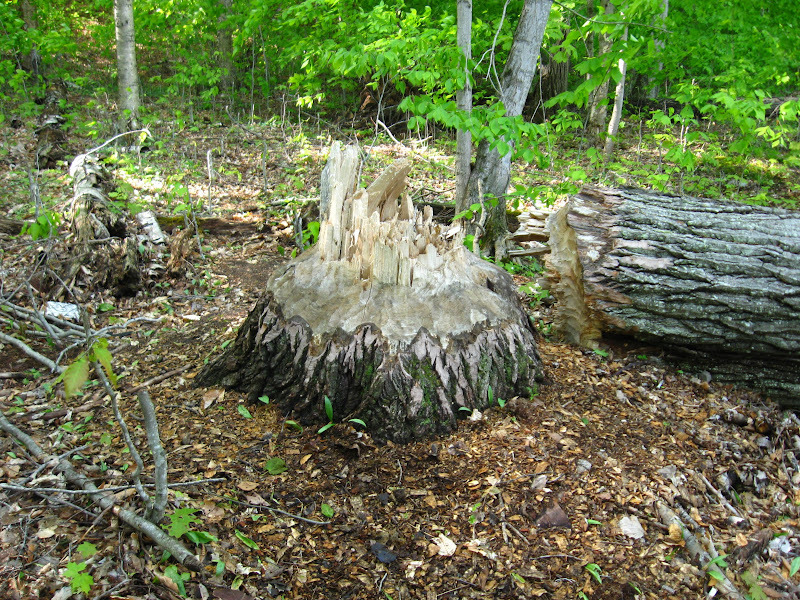 Was this brought down by a beaver? It seems awfully large. 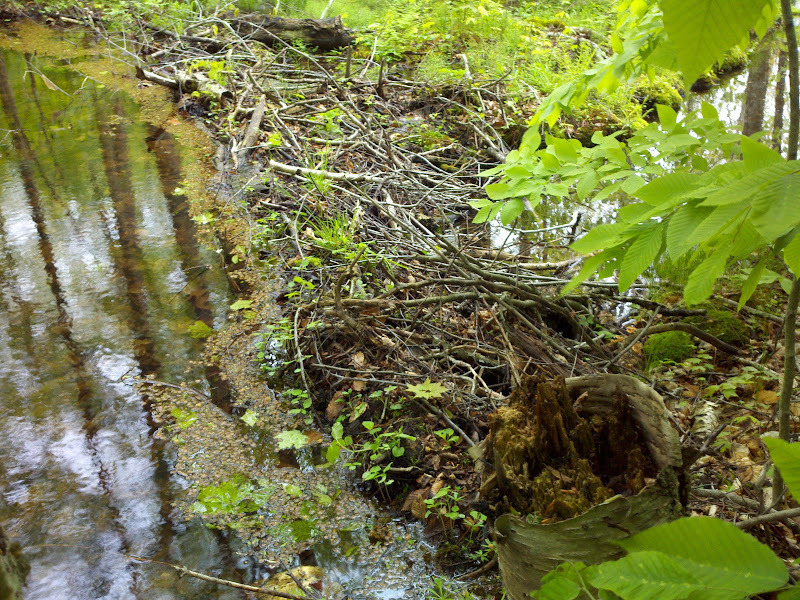 Continuing north along the stream that feeds Tamarack Lake, I find the beaver dam. The trail continues north to Swanson's field, where I find a good camping site, in the woods, yet close to an open field, water, and a fairly well maintained trail. I mark it on my GPS. Moving west, I map out the road that goes from the big barn through the big field. There's no internet service here, and I want to get the weather report. 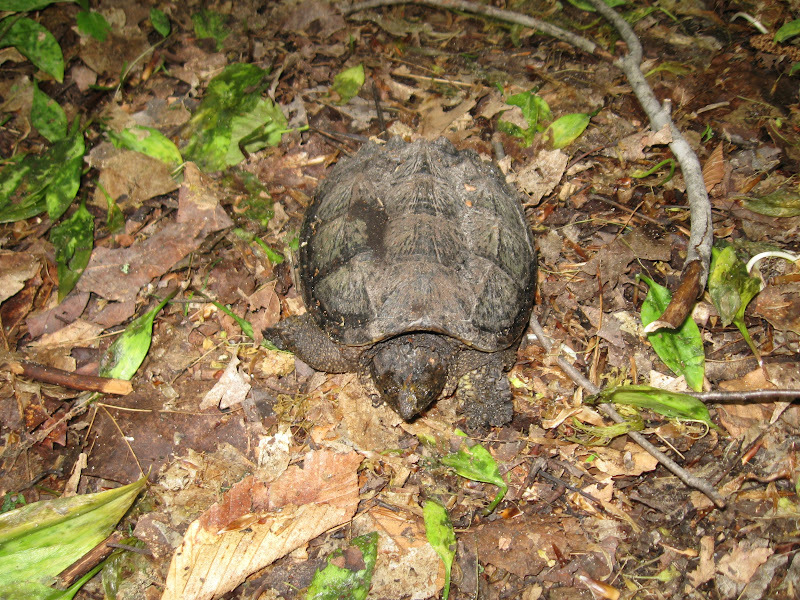 On my way back to camp, I almost step on this snapping turtle just sitting in the middle of the road. I finally find some service at the good picnic area and can see what coming in the next few days. Last night was nice, calm, and no rain. I take my time packing up camp, and cook my last meal here. I figure with the coming storms, I might not be able to make fire again for a few days. I make my way to the south side of Tamarack Lake, following the secret trail, and to my surprise, I found a couple there! Tamarack is a beautiful little lake, only about a quarter mile across. I've heard rangers telling people that it doesn't exist any more. It is more challenging to find, and I've never seen anyone else here before. Continuing on, I experience the highlight of the day, finding the road that goes around the south and east side of Tamarack Lake. As it turns out, the campsite I was at the last few nights was the intersection of those two roads! I suspected so a couple years ago, but I just couldn't see them. Now I know. 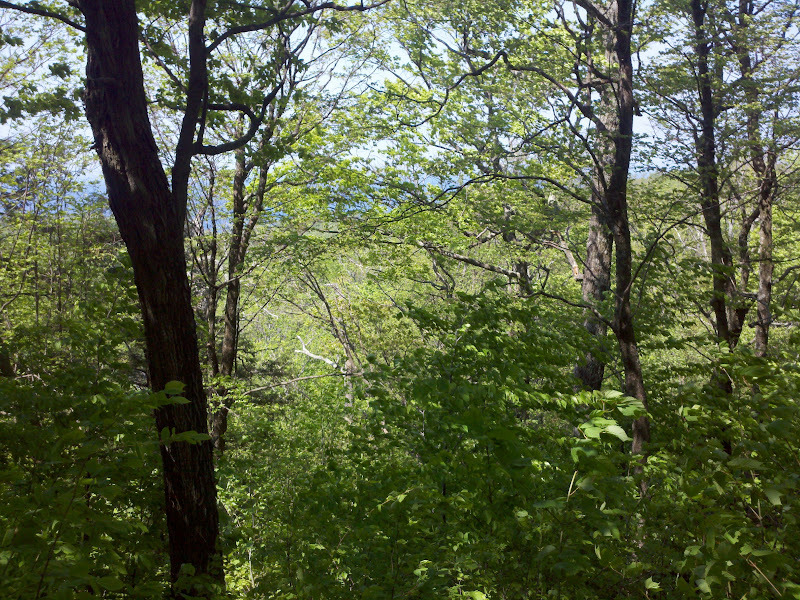 I continue north towards Lake Manitou, up the ravine, and more bushwhacking. I finally make it to the boathouse, only to find more campers. I'm sure they were surprised to see me, as I came not from the only known trail, but from the middle of the woods with a full pack. I walked along the south side of the lake, and up the west side. All the good sites are too close to the water. 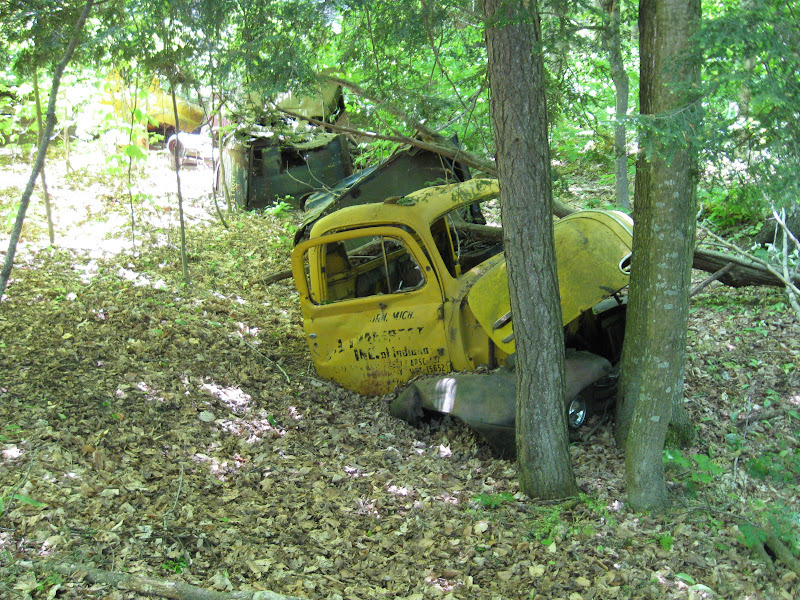 All the legal sites are a good hike through the bush. I finally settle on a spot. It's dark now, thundering and raining, and I've still got everything on my back. Setting up camp in the dark during a thunderstorm is no fun, but it turned out okay. I did have to transplant several saplings to make room for myself. A truly beautiful morning, birds singing, warm, and sunny. This has been a very busy weekend, people everywhere. I suppose they're all headed back home now. Today was a nice relaxing zero day, just going down to the lake, basking in its tranquility, checking messages, charging batteries, etc. I can hear the people across the lake talking about how huge the perch are. Here are some more hammock pictures. My rain fly can be folded completely over and out of the way if desired. And with the hammock zipped up, you can lay on top of it, rather than inside it. That makes it very comfy for an afternoon nap. I was very comfortable sleeping without the sleeping bag last night. 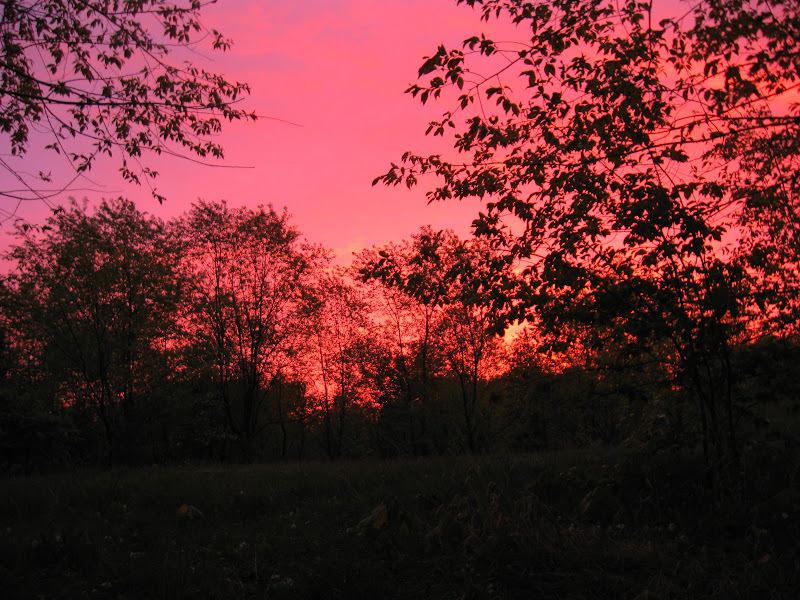 I woke up this morning just before sunrise. I'm able to get the forecast, which calls for a hot sunny day until this afternoon, and then heavy storms will be moving in for the rest of the night. Today I'm hiking north, back to the potholes. 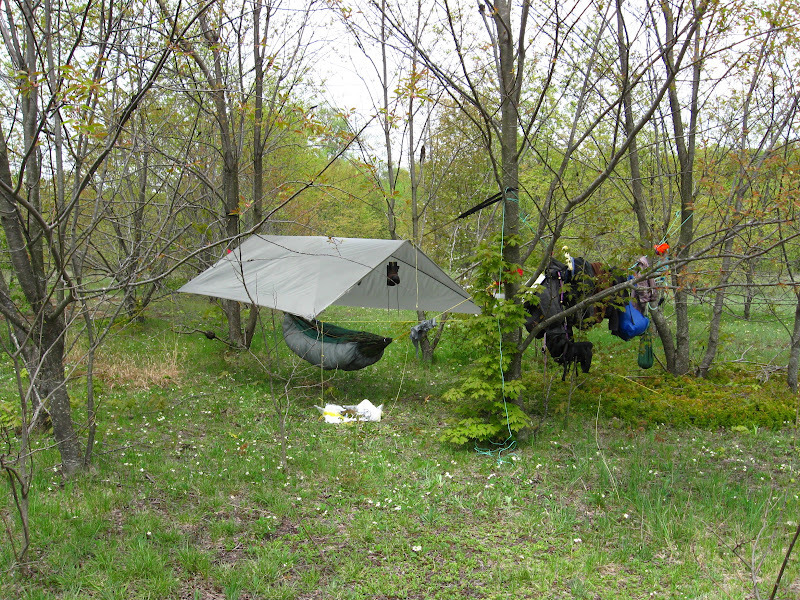 I find a GREAT campsite near the northwest corner of the lake, 300 feet from the water, spacious and open enough for many tents, but also lot of trees for many hammocks. 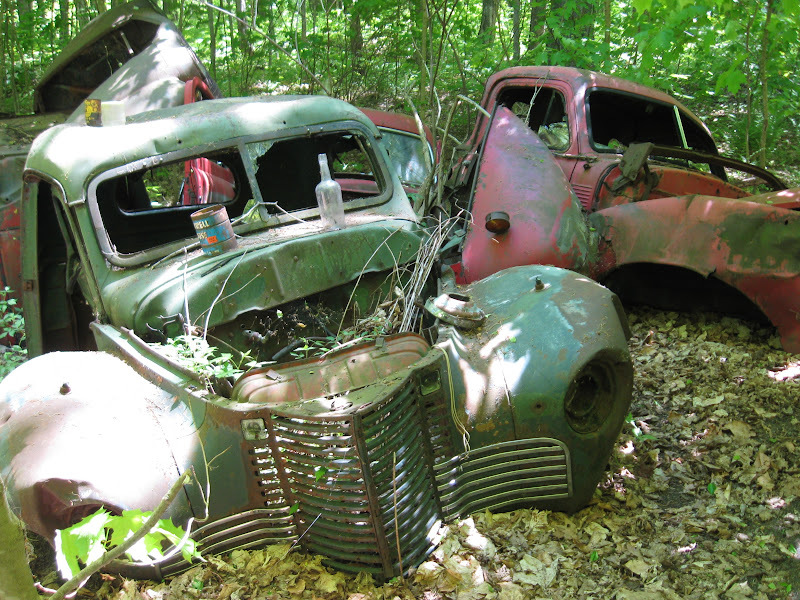 And it's just out of sight from the road. I've got this marked on the GPS now for my next trip. Up at the potholes, the western branch of the potholes trail goes along the ridge of them, and is scenic looking out. I can hear the cry of an eagle, but can't see it, and keep walking. Suddenly there's a very loud noise as it takes flight from a branch about 15 feet above my head. On my return trip, I also find the road that goes from the potholes down to the shore. It was pretty easy to follow for the most part, but I was watching the clock, wanting to get back to camp before the big storms hit, so I didn't follow it all the way. I followed the westernmost trail that runs south along Lake Manitou, which my GPS showed as connecting to the shoreline road, but it does not, and I don't see any sign that it ever did. 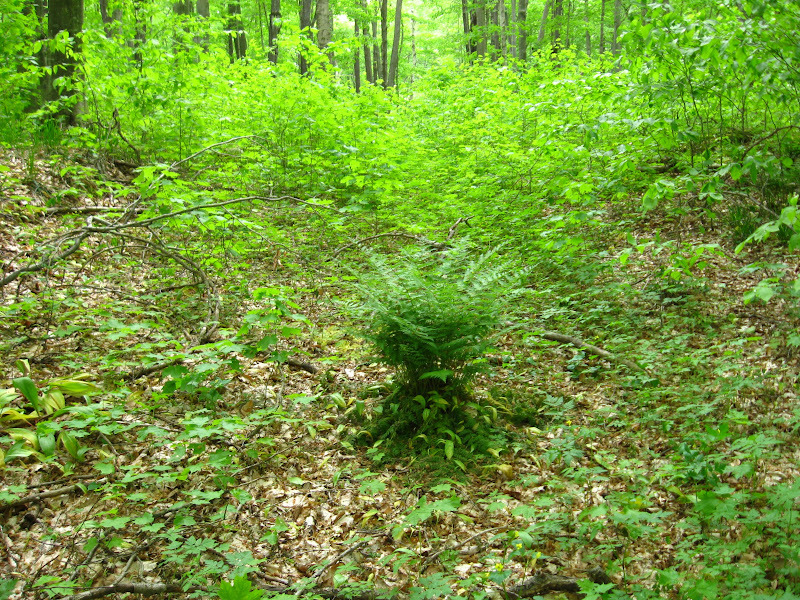 But I did find this lonely fern in the middle of the road. It seemed rather out of place. Today has been a very pleasant day for hiking, temps in the upper 70s, but with a constant breeze to keep most of the bugs off. I get back to camp in time to prepare for the storm. I hear the first thunder rolling in at 17:47, and the breeze suddenly turned cold. 17:53, and the raindrops start falling. I've got all four corners of the rain fly pulled out and tied to trees. 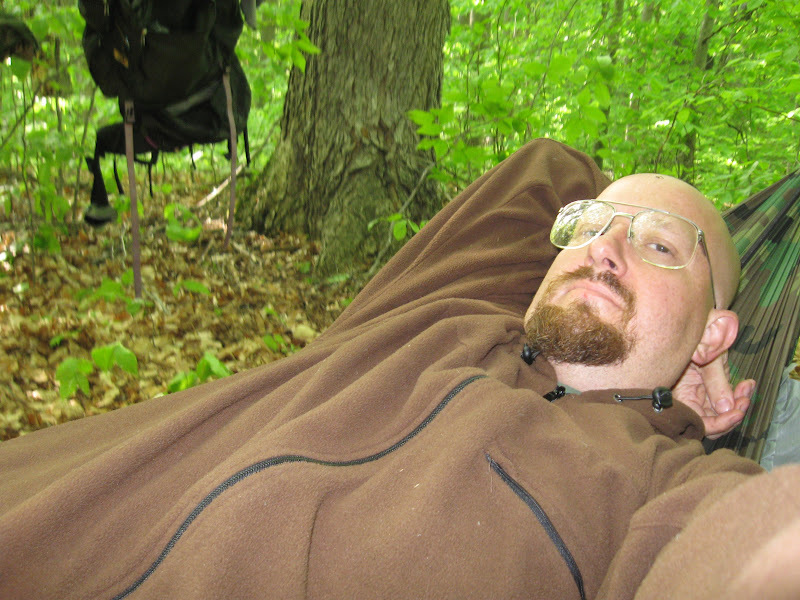 My poncho is between the rain fly and my hammock, to divert any drops that make it through the fly. I recheck the forecast, and I'm under a SEVERE thunderstorm warning. This should be a good test of my gear. By 1800 everything was finished. I'm actually disappointed. Had I known it was going to be such a brief storm, I would have stayed out hiking the roads. Bummer. Now it's too late to go anywhere. Oh well. It was still a nice day. Last night was a long night, too long, considering how early I turned in because of the so-called "storm". Today should be nice. I plan to head east to the spot with good reception, which I call the "phonebooth". My batteries aren't charging at all here, too much shade, not enough open space with sunlight. Even at the lake shore, the overhead trees get in the way by midday. I pass a couple fishermen on the south side of the lake as I made my way to the phonebooth. They were surprised to see me. They thought they had met everyone on the island. It turns out the transit company cancelled the ferry for today, and they're stranded here for another day. I make it to the "phonebooth". Voice service was great there, and even internet service wasn't bad, but it was intermittent. Sometimes I'd pick up full 3G network, but then it wouldn't stay for too long. I make a couple appointments for jobs when I get back. On my way back to camp, I find a new kind of snake. 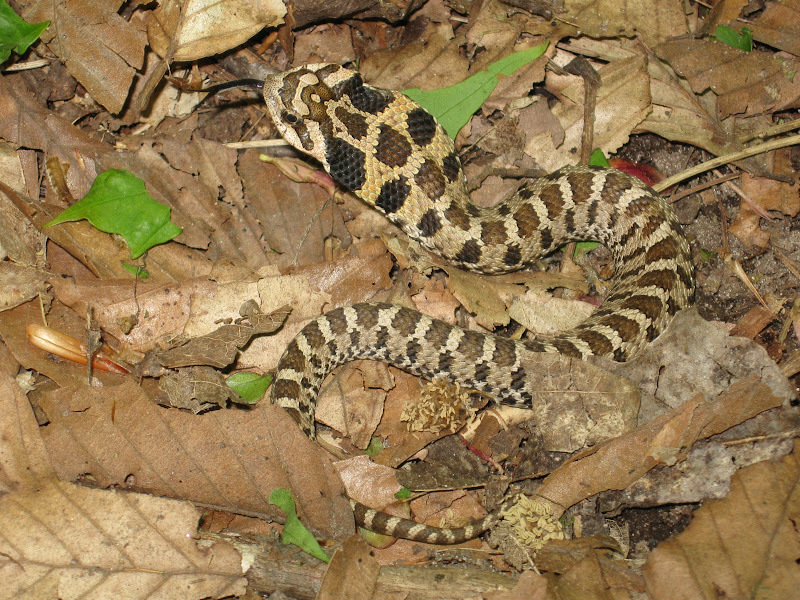 I've since identified it as a hognose snake, which are only mildly venomous, but rarely bite anything but their prey, and so are not considered dangerous to people. 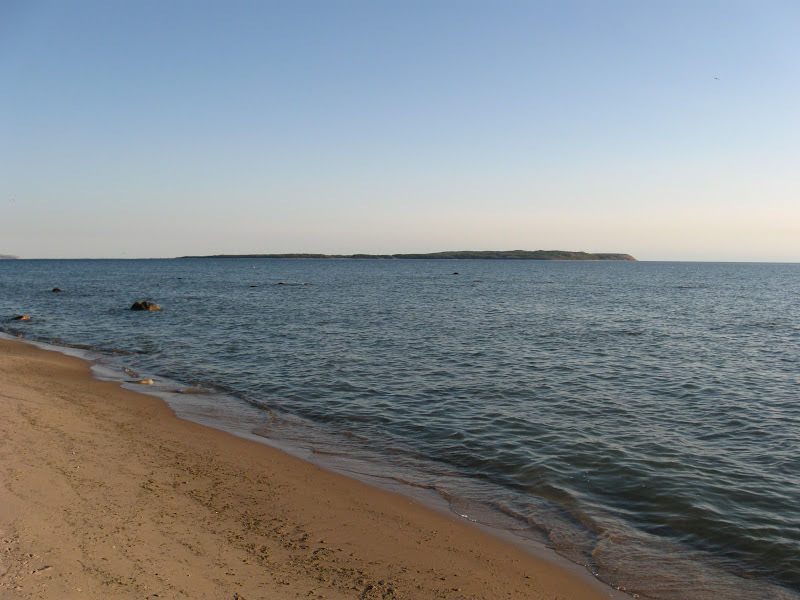 This is a beautiful calm evening, and I'm just relaxing on the shore of Lake Manitou. My days here are numbered now. During this trip I had been thinking how nice it is to not feel rushed, being here for two weeks, but now that it's drawing to a close, it seems like the two weeks have flown by, and I didn't make it to half the places I had hoped to. But that's okay, because vacations are about relaxing, too. It was a calm night, and looks like it will be a sunny day. Today I'm heading north, to map out the section of road to the pole bridge. 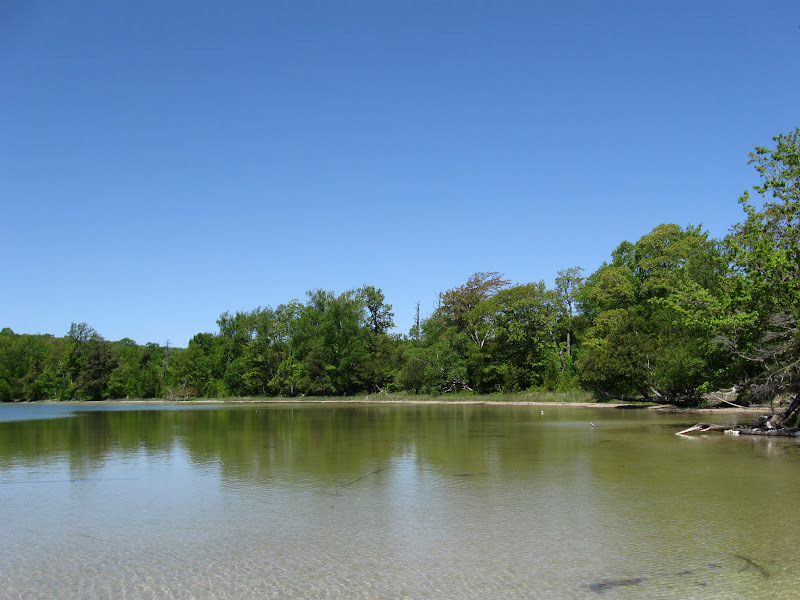 The northern shore of the lake is a beautiful beach area, and the lake is shallow and sandy. This would be a great place for charging batteries. 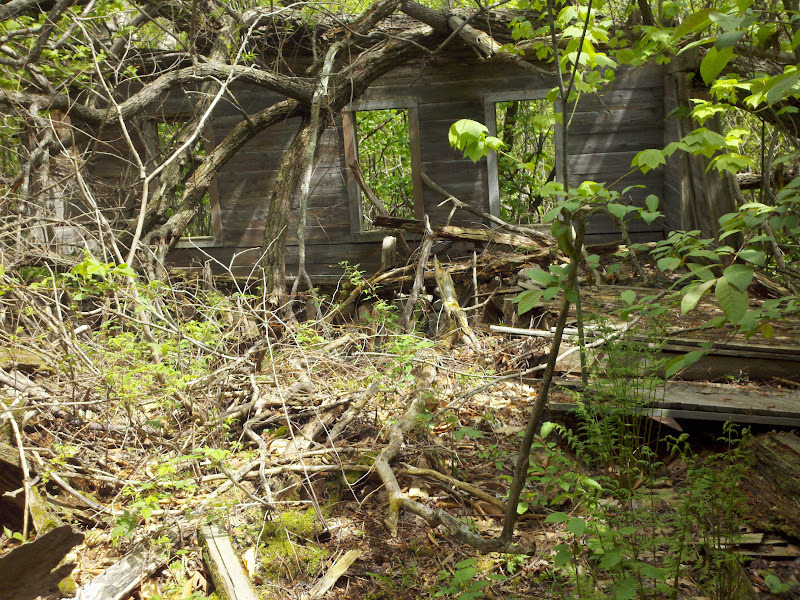 But I also checked around, and there isn't any good camping right here, everything being too marshy north of the shore. So, great to play and charge, but not to set up camp. 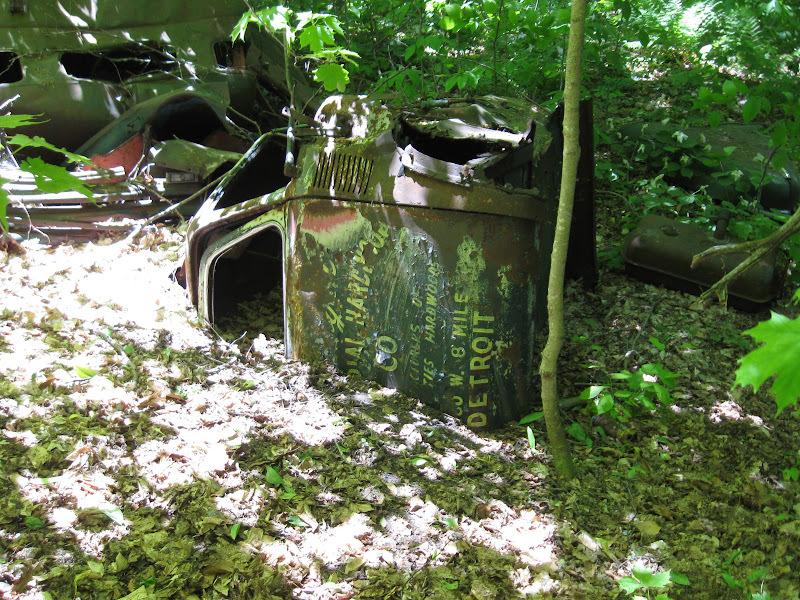 But this is close enough to the excellent campsite I found earlier on the west side. 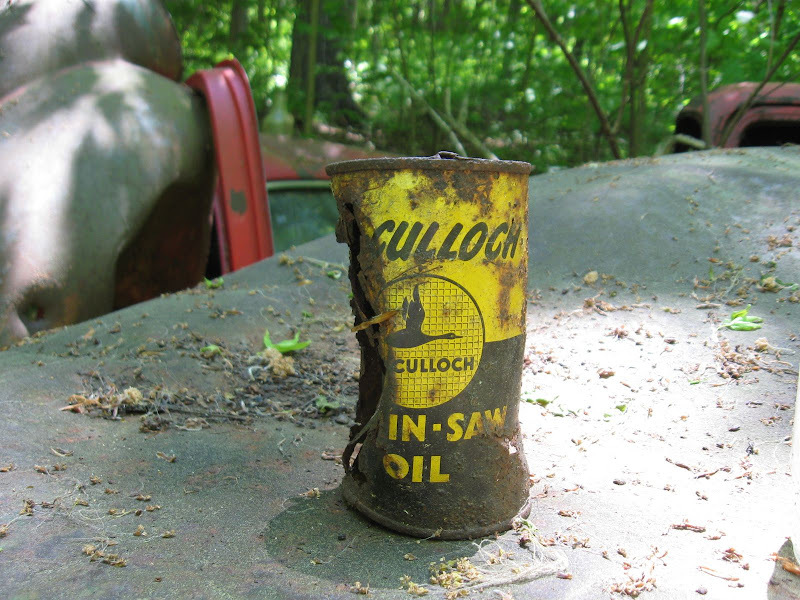 My discovery of the day was the old junkyard at the Stormer camp. It's amazing that after eleven years of visiting this island, every time I still see something new. 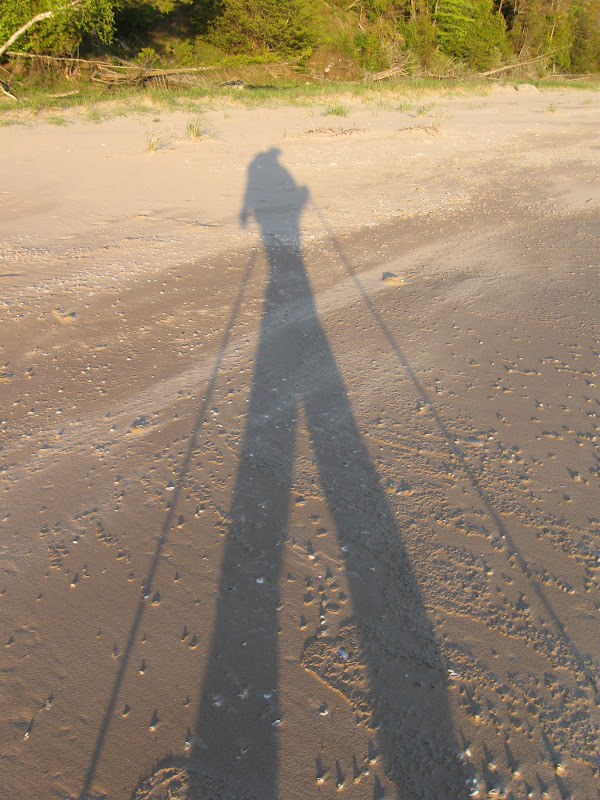 I packed up early this morning and hit the trail, headed for the boathouse, where I can lay my solar panels on the beach in the sun, and recharge my batteries while I hike around all day. The "boathouse" has recently been restore as a project by a boy scout. 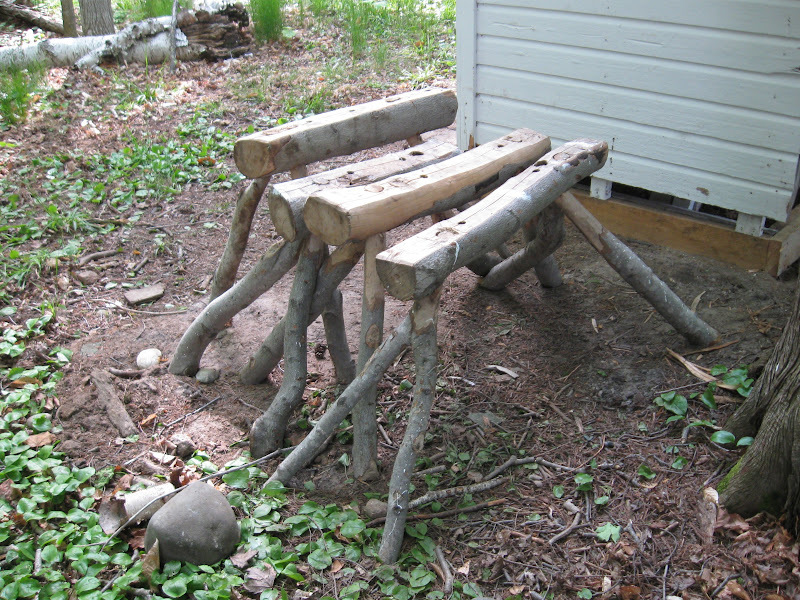 To the side, I find a set of primitive sawhorses. But then I realized that there will be a fresh load a campers arriving today, and I don't really want to leave my solar panels sitting out in the open in such a popular destination while I'm out hiking miles away. So I keep hiking past the boathouse, towards the dock. Maybe I'll stay at the village campground, next to a big field where I can easily hide the chargers. But as I make it to the east side of the island, it's starting to feel like more rain is coming. And I look at the clock and realize I can make it in time for the ferry. So it was a last minute decision, but I jump the boat and head to pizza hut. Two weeks was still a pretty good stay. What an excellent trip report thank you. You have an excellent eye with that camera, very nice. Great report! Thanks for sharing! Two weeks.....envy here on this end! Whooooo Buddy.....terrific briefing on your romp. Truly enjoyed the photos too. Well done 3club. A great trip report. Good trip report and pics. 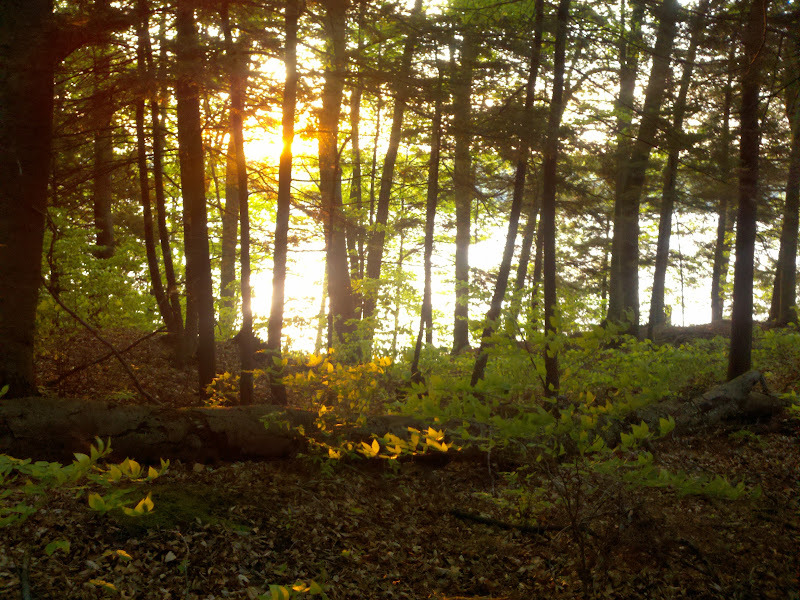 Really liked the look of the forest around there. " My days are numbered". I remember that feeling from when i was a kid on summer holidays from school. Glad you got to spend a bunch of time in a favorite place.
" The mind creates the abyss, the heart crosses it." Looks like a trip to put on the list for sure! Outstanding trip report. I REALLY enjoyed your report and pictures!!! 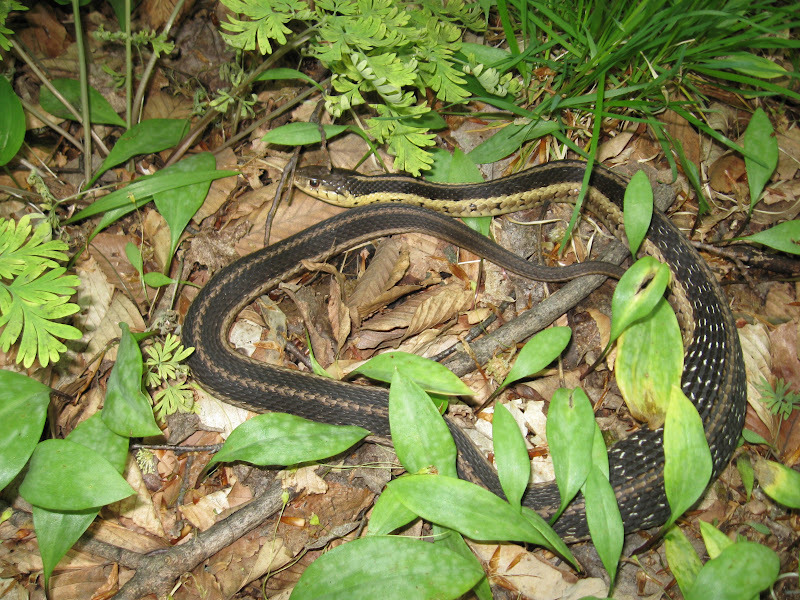 FYI: the garter snake and snapping turtle are sitting in trout lilies. Their mottled leaves are very distinctive. Too bad the blooms had already faded. They're a beautiful flower. I was very impressed with your tarp design. What does it weigh? Where did you get the poles for it? 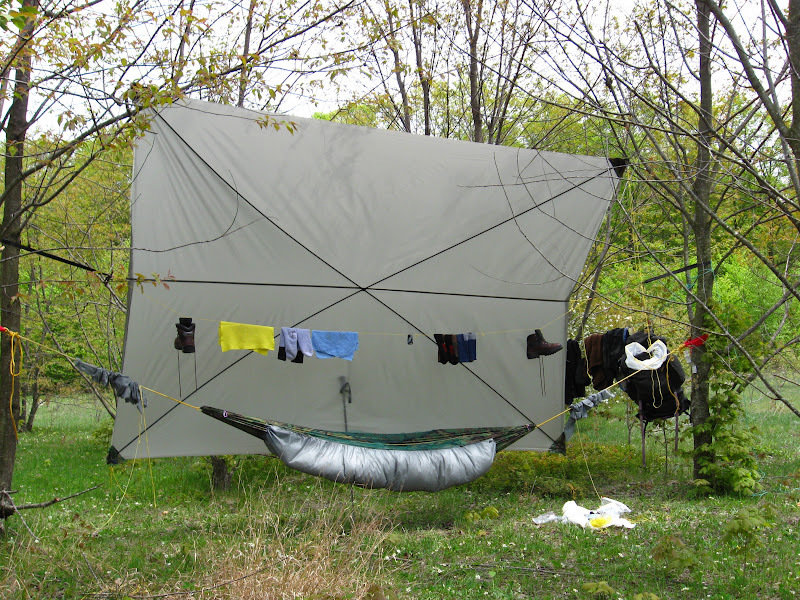 I'd love for you to start a new thread about your tarp with photos and more info on how you made it. Thanks!!!! ​In quiet covers, cool and gray. Surely, God could have made a better way to sleep.